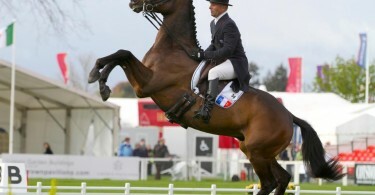 Sunday was again full of action illustrating the highs and lows of eventing in one day. The day started with the CCI*. There were a couple of withdrawals after the XC but the vast majority started the showjumping and although a few may have looked a bit tired the vast majority looked great which can only be thanks to the superb going XC the previous day. The CCI* track although square and technical was a fair challenge for the level and errors were generally evenly spread around the course without overly punishing the more tired looking horses. There were not though large amounts of clears so the leader board still saw a fair amount of change especially in the top 10 as 4 faults became the norm. 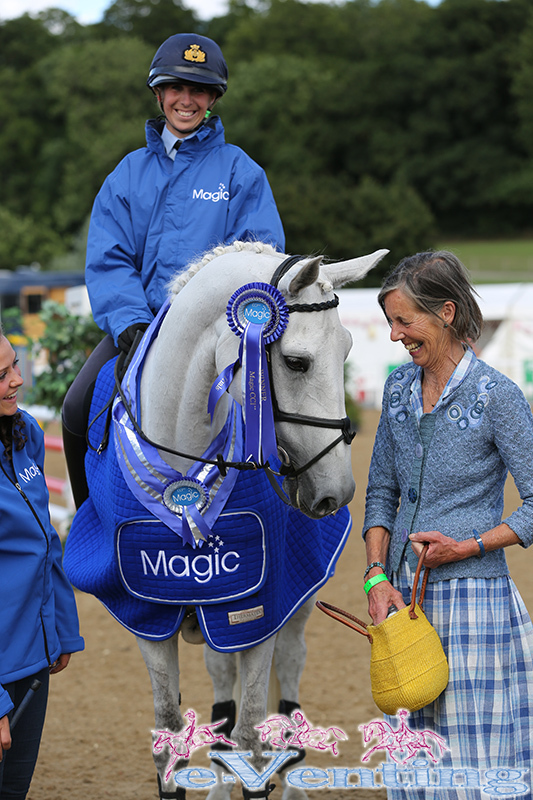 Helen West who has recently been appointed as manager at Bicton Arena won aboard Foxdon Sunny Jim, a new ride on whom she had completed only one event previously. 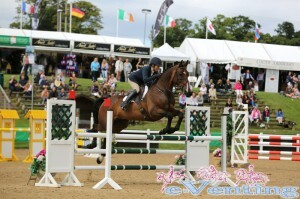 They jumped clear to put pressure on overnight leader Danielle Dunn riding V Zermie 51. Danielle knocked an early pole handing the win to Helen before tipping a second through the combination. Jimmy’s owner Jessie Morton explained last year had been difficult for him so after a successful run at Hatherleigh where they finished 4th, Hartpury was to be a ‘see what happens’ event. Jimmy surpassed all expectations to win and both Helen and Jessie could not be more delighted, Jessie actually jumped for joy when the influential pole fell running off to tell Helen of their success. 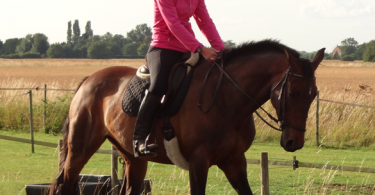 Amusingly apparently several comments had been made in jest about Jimmy over the weekend relating to his larger than average frame for an eventer (he is definitely a Jumbo horse!) but all critics were silenced when finishing on his excellent dressage score that had initially led the first phase for some time. Sacha Hourigan ultimately finished in 2nd and 4th on her two rides Themis and Kantaral, with Vincent Martens 3rd on Flugel Van De Witte Poort. Richard Waygood rounded up the top 5 on Luther II. Tom Rowland had a far better day after the previous day’s incident to finish 8th on The Carnival Cavalier whilst also winning the best U25 prize. The event came to a close with the Showjumping of the CCI** where like the CCI* faults were evenly distributed around the course. CCI* winner Helen West came back to earth with a bump after her earlier win quite literally, after Mon Chapelle refused. Thankfully nothing worse than a bruise or two and not enough to take the shine off her win. 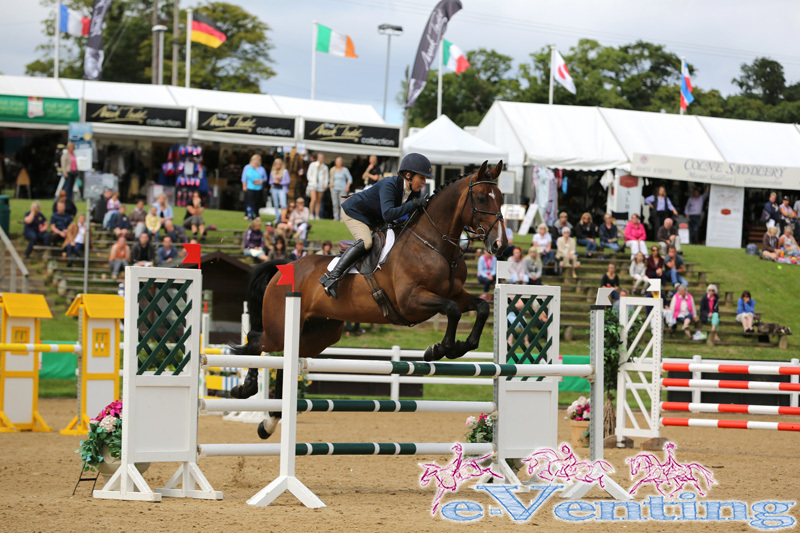 The top 20 were quite closely bunched so a pole down proved quite expensive for some combinations with Jason Hobbs, Chris King, Pippa Funnell and Dirk Schrade all dropping out of the top 10 after picking up 4 faults. The top 5 all finished on their dressage scores a feat only matched by two others who both finished within the top 15. The bookies’ favourite leading from start to finish Vittoria Panizzon riding the much lusted-after Borough Pennyz showed her class to produce a great clear round to win. She look to be slightly more anchored back than usual but still looking impressive compared to many, but then this is not a combination now often seen at 2*. 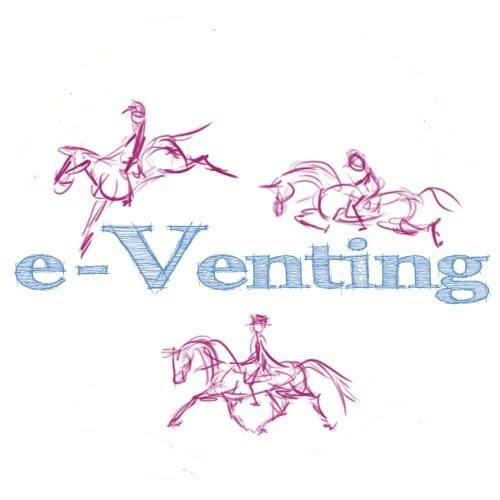 Many actually were wondering the reason for their entry which is simply answered that the FEI introduced reverse qualifications for combinations who suffer two successive horse falls. Because they fell at Barbury and Gatcombe, to regain their qualifications they were required to gain a qualifying result at 2*, and that they did in style. 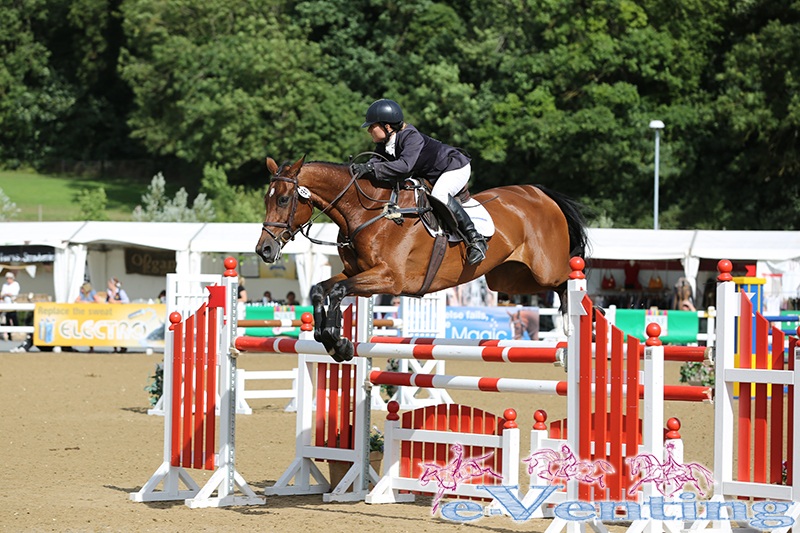 Lucinda Fredericks posted a convincing clear on The Navigator who doesn’t have the best showjumping record and in fact only 3 months earlier with a different rider suffered compulsory retirement after clocking up 24 penalties in the showjumping phase of an intermediate. 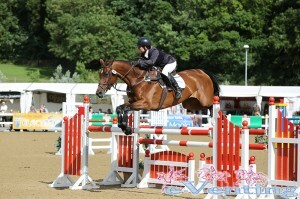 Oliver Smith riding Noon Hill finished in 3rd and Tim Price on Wembley III 4th. Tim also picked up 8th place on Zibor. 5th place went to Alex Postolowsky on the stunning Wutella. This 10yo mare literally floated into the arena with a trot many dressage riders dream of riding upon before jumping a text book clear never looking in danger of touching a pole, certainly a combination to watch as they have had excellent results this year. So another year is over for Hartpury although as many will know there is an investigation in to Saturday’s incident involving the collision between Tom Rowland and an official’s car. Yes it should never have happened but there will be lessons to be learnt and hopefully the result will be safer events for horses, riders, spectators and cars! But the incident can not distract from the huge amount of hard work by the organising committee and the vast army of volunteers who allowed the event to run as successfully as it did. The facilities at Hartpury are absolutely first class and the huge amount of time taken to ensure perfect going cross country was greatly appreciated by all those competing especially the horses. So to the organisers thank you and we look forward to returning again next year!